Here’s what happened at the 2018 Festival….. Joining us from Guelph, Ontario, we had Cynthia Kinnunen teaching her Ookestra workshop and performing at the Saturday evening concert. In Cynthia’s earlier years, following studies in piano, flute, bassoon, oboe and voice, and after completing her conservatory piano levels and a university degree in music, Cynthia dove into marketing and fundraising in the arts and non-profit sector. 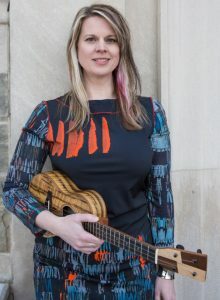 A Level 3 James Hill Ukulele Initiative teacher, she now currently teaches private music instruction in ukulele and piano, ukulele group classes, the Royal City Ukulele Ensemble program, and is Director of the Royal City Uke Fest in Guelph, Ontario. Passionate about the role that music can play in our lives, our homes and our communities, she encourages everyone to learn and make music, no matter their age or ability. 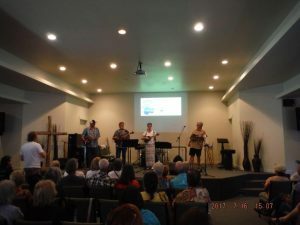 All the way from Provo, Utah, The Naked Waiters provided a fun evening at the Saturday concert. 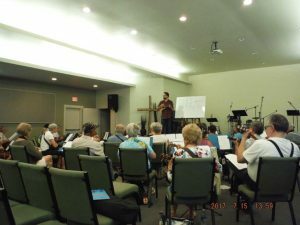 They will also presented two workshops on Saturday; Strumming & Picking Styles and Songwriting. 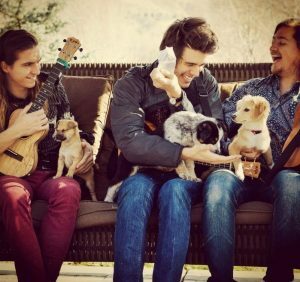 The Naked Waiters are an acoustic, ukulele-based group that started in Cedar City, UT, and is now based in Provo, UT. They specialize in fun, melt-your-heart music with handsome harmonies. They are comprised of Kim Bjerga, Clark Holmes, and Andy Nufer. 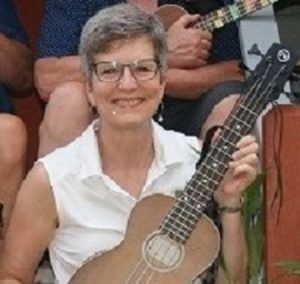 Liz DeBarros, a member of Parksville’s own Revolving Doors and a James Hill Ukulele Initiative (JHUI) Level 2 certified ukulele instructor, gave two beginner workshops. ABSOLUTE BEGINNER workshop on Saturday morning. Uke 101 is for those who have never played or even held a ukulele before. In the afternoon in Uke 102, new players moved on and develop their skills. On Sunday afternoon Liz also be performed with the Revolving Doors. Thank you to all of you who attended and participated in the 2017 Nanaimo Ukulele Festival making it a great success. It was with your support that this festival lived up to it’s tag of a “great little ukulele festival.” James Hill and Anne Janelle put on an awesome concert and many people commented on how much they enjoyed the workshops. Everyone enjoyed the Sunday afternoon concert with the Revolving Doors band and the sing and strum, lead by the band, was the best ever. We all had a great time. The Revolving Doors band playing the Sunday afternoon concert at the 2017 festival.